These days it gets harder and harder to get away from it all. No matter where we are in our daily lives, we can be reached in moments via call, text, instant message, or email. And when you decide to go on a camping trip with your family, those same people don’t seem to understand that one of the reasons for going is to disconnect. So how to you strike a compromise between bringing only the essentials, and still being able to be reached? You can start by taking using your campfire to recharge your phone. 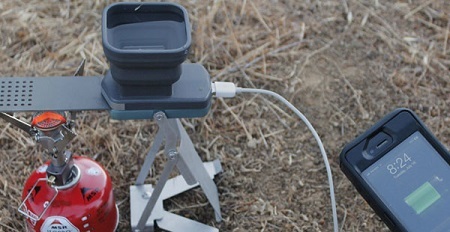 The FlameStower is an interesting product that will charge your gadgets by using two elements that you’re sure to have plenty of while you’re camping: water and fire. It’s odd to think that under normal circumstances, these are two things you would want to keep your phone a safe distance from. In order to use this gadget, you just unfold it, pour in some water, and put it near an open flame, or other heat source. Then, plug in your phone, and within a few seconds, you should start getting a charge. It will charge pretty slowly, with a maximum output of 3W, but that’s to be expected with this type of power source. The other great thing about this charger is that it has uses beyond camping. When you have a power outage, you tend to turn to candles as a steady source of light. Why not use a large candle to slowly charge up your phone, in case you need it? If you want a FlameStower for yourself, you can pre-order one for $70, and get it sometime in the late fall.